COLOMBO: Anil Parakrama Samarasekera has been appointed the fifth Serjeant-at-Arms. He joined the Parliamentary Service as the Assistant Serjeant-at-Arms in 1996. He was later promoted to the Post of Deputy Serjeant-at-Arms which he served for nearly a decade. Samarasekera has undergone special training for Deputy Serjeant-at-Arms conducted by the House of Commons in the United Kingdom in 2003. Having studied at Royal College, Colombo, he started his career as a Cadet Officer in the Sri Lanka Navy. He was a Commissioned Officer in the rank of Lieutenant at the time of joining Parliament. During his stint at the Sri Lanka Navy, he underwent special training in India. He also served as a Naval Instructor at the Kotelawala Defence Academy, Ratmalana and at the Naval and Maritime Academy in Trincomalee. He was also attached to the Sri Lanka Shipping Corporation. 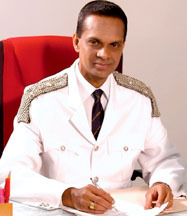 Narendra Fernando, Assistant Serjeant-at -arms succeeded Samarasekera as Deputy Serjeant-at-Arms.